AREA LOCATION STILLORGAN, close to Waltersland and Clonmore with a gate lodge on what is now Oaktree Road. 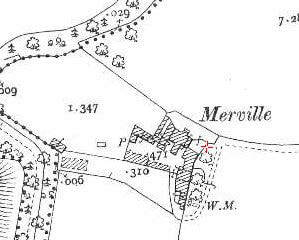 MAP LOCATION OSI maps of 1838-1845 and 1898-1913 place it in the townland of Mulchanstown and it is annotated as Merville on both. GENERAL Small demesne with good gardens and a beautiful Greenhouse and gatelodge. Its location was described as 'second gate above the Brewery on the Leopardstown road' in 1852. VALUATION In 1912 the valuation was 40 pounds and in the 1911 census it is noted as having 7 rooms occupied by family. 1858 - 1862 James H Ferguson Esq.